Raising his eyes toward his disciples Jesus said: “Blessed are you who are poor, for the Kingdom of God is yours. Blessed are you who are now hungry, for you will be satisfied. Blessed are you who are now weeping, for you will laugh. Blessed are you when people hate you, and when they exclude and insult you, and denounce your name as evil on account of the Son of Man. After calling forth the twelve disciples, Jesus taught them what are the true blessings and woes in this life according to God, so that they know what is more valuable in the long run, and seek less what this world pursues after. 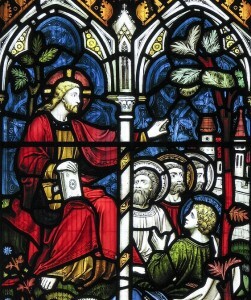 In the gospel according to Luke, Jesus described the following conditions as blessings: poor, hungry, weeping, and being excluded and insulted on account of the Son of Man. Then He listed out what are the conditions in this life that are actually woes: being rich, filled, laughing, and being spoke well of by other people. What Jesus called blessings and woes are obviously the opposite in the eyes of this world, and because of this, it’s important for us to let go of our earthly values, and reflect on Jesus’ teaching in our heart. For example, we need to ask ourselves if we’re focusing mostly on the present life and happiness, and forgot to take up our daily cross to follow Christ? Or, when our faith is being challenged, did we stand up against this world, or are we compromising to make more friends than enemies? To do what Jesus said could mean suffering in this life, but Jesus wants us to look beyond this life, and rejoice when the time of trial comes, because prophets, and Jesus Himself, were being treated in this way, yet the rewards are great for them in heaven. Therefore, which shall we value more: this life or the life to come? To learn more about the Beatitudes in the gospel according to Matthew, please read this article.